“Carry Me Back to Old Virginny”–how should we feel about it? 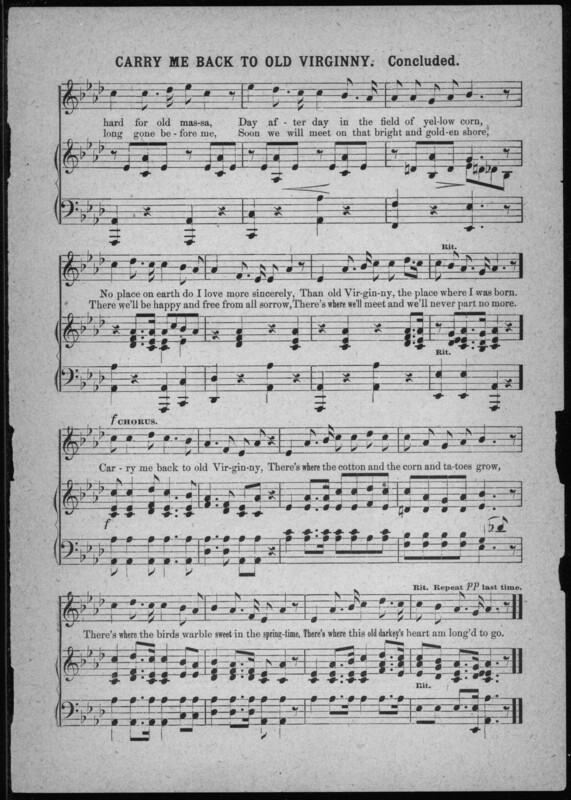 The element of this that I find most intriguing and complex is that the song was written by a black man, James Bland, to be performed in blackface minstrelsy. As we discussed in class, white people performing in blackface is an inappropriate and, quite frankly, a disgusting practice, but the morals get a bit trickier when it comes to black people performing in blackface. 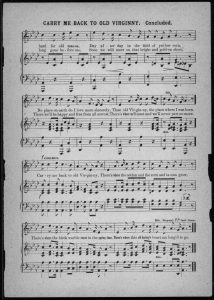 Bland used minstrel shows to his professional and financial benefit, using the stage as a platform to broadcast his musical compositions.5 In light of this, should we reconsider his song, “Carry Me Back to Old Virginny”? Is this a racist song? Or could it be a satire, “illustrating Southern white slaveholders’ longing for the past when they were masters and African Americans were under their subjugation”?6 Either way, is it wrong to discount a song that was a prominent feature of a man’s career that likely would not have come to fruition if it wasn’t for the popularity of minstrel shows, for better or for worse, blurring the color line and giving blacks the opportunity to participate in American popular culture? 1 McDowell, Joseph Nashe. 1860. “A letter to the Rev. Henry Ward Beecher, and an address to the legislature of the state of Missouri.” Slavery and Anti-Slavery. Gale. St. Olaf College Libraries. http://find.galegroup.com/sas/infomark.do?&source=gale&prodId=SAS&userGroupName=mnastolaf&tabID=T001&docPage=article&callistoContentSet=LCPC&searchType=AdvancedSearchForm&docId=DS4103086904&type=multipage&contentSet=ECCO&version=1.0&relevancePageBatch=DS103086895&docLevel=FASCIMILE (accessed March 8, 2018). 2 Hischak, Thomas. 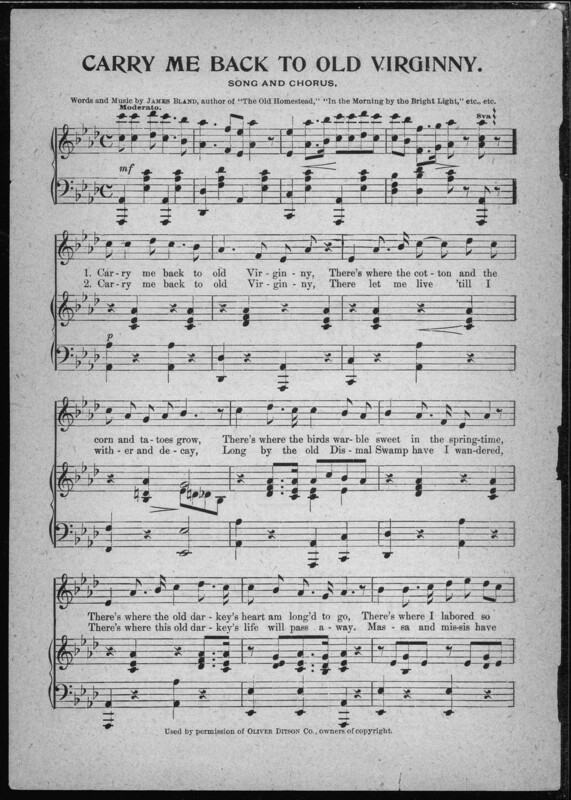 “‘Carry Me Back to Old Virginny’ (song, 1878).” The American Mosaic: The African American Experience, ABC-CLIO, 2018. africanamerican2.abc-clio.com/Search/Display/1571989 (accessed March 8, 2018). 3 Erickson, Shannon. “Bland, James A. (1854-1911).” Blackpast.org African American History. http://www.blackpast.org/aah/bland-james-1854-1911 (accessed March 8, 2018). Minstrelsy refers to the form of musical stage entertainment in the 19th and early 20th century that sought to parody black slave culture. The hallmark feature of minstrel shows was the use of blackface – white actors covering their faces with burnt cork to appear as and make fun of African Americans. Today, white Americans hear the words “minstrel show” and cringe with embarrassment. How could something seemingly so racist have been such a popular form of entertainment? Despite a more thorough acknowledgement of the ways in which racism has plagued our country for centuries, it would be a crime to ignore remnants of minstrelsy in our society today, and subsequently, to dismiss the conversation surrounding whether we reclaim or ignore elements of minstrelsy today. 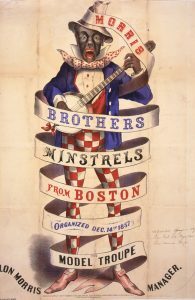 Advertisement for the Morris Brothers minstrels from Boston, c. 1869. When exploring minstrel-related themes on the African American Experience database, I was struck by one particular image. 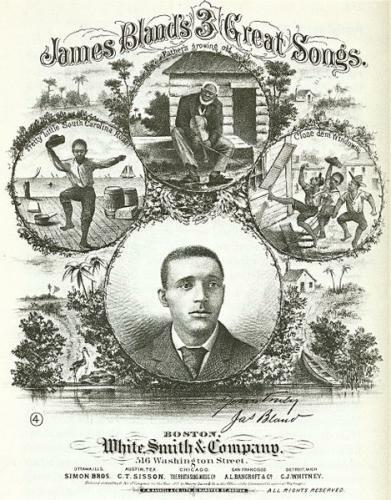 The image (left) depicts an advertisement for the Morris Brothers Minstrel group. The figure’s blackface and bright, big red lips are obvious features, and his banjo emphasizes the theatrical portion of the traditional minstrel show. 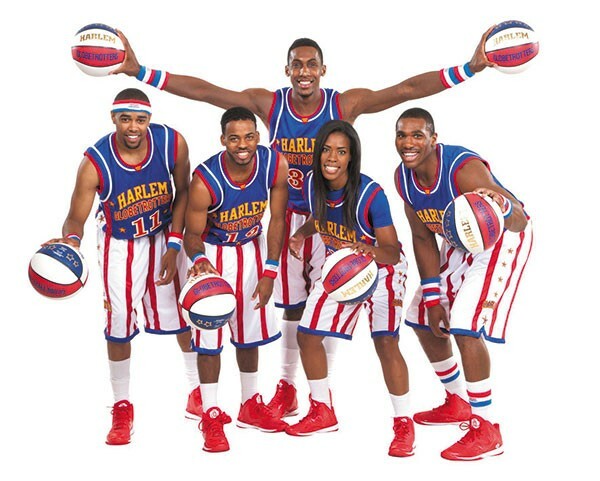 The costume is striking when compared side-by-side with an image of the Harlem Globetrotters (below), an exhibition basketball team who combine athletic ability, comedy, and theater on their wildly successful tours. The Harlem Globetrotters represent a prime example of contemporary form of minstrelsy: an all-black performance troupe, using showmanship and comedy to entertain primarily white audiences. For obvious reasons, the Harlem Globetrotters are not problematic in the same way as traditional minstrel shows, but it nonetheless begs the question: how do white Americans appreciate these forms of entertainment, while simultaneously acknowledging the troubled history to which they are intrinsically related? This question led me to think of other popular forms of entertainment in the 20th and 21st centuries that reflect minstrel themes, and there are countless. For example, towards the tail-end of minstrel show’s run, the 1920s/30s-radio program Amos ‘n’ Andy featured white actors portraying black characters, a sort of auditory blackface. More broadly, hip hop altogether also walks this fine line: a popular genre of music with primarily African American origins. In its near 50-year history, hip hop has been commercialized to meet the demands of white audiences, and many feel that the prevalence of white rappers in the industry represents a metaphorical blackface. How do we interpret these similarities today? Are they successful attempts at reclaiming minstrelsy themes, or do they gloss-over and ignore the racism associated with minstrel shows? 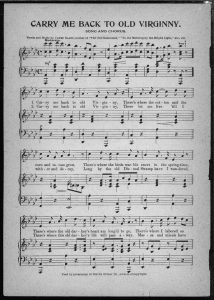 Sheryl Kaskowitz touches on this struggle in her article on reclaiming the songs of blackface minstrelsy. Ultimately, these questions are difficult to answer, and the truth likely lies somewhere in the middle. But, I would argue, successful reclamation – as evidenced by the popularity of the Harlem Globetrotters or the powerful minstrel song performances by Rhiannon Giddens – might go a long way in addressing these historical wrongdoings, while simultaneously preserving them for future generations. Certainly, not an easy task, but an important one at that. “Minstrel Show Advertisement.” In The American Mosaic: The African American Experience, ABC-CLIO, 2018. Image. Accessed March 7, 2018. https://africanamerican2.abc-clio.com/Search/Display/1612307. Watkins, Mel. “What Was It About ‘Amos ‘n’ Andy’?” The New York Times. July 06, 1991. Accessed March 08, 2018. http://www.nytimes.com/1991/07/07/books/what-was-it-about-amos-n-andy.html?pagewanted=all. Taylor, Yuval, and Jake Austen. Darkest America: Black Minstrelsy from Slavery to Hip Hop. New York: W.W. Norton & Company, 2012. Kaskowitz, Sheryl. “Before It Goes Away: Performance and Reclamation of Songs from Blackface Minstrelsy.” The Avid Listener. Accessed March 08, 2018. http://www.theavidlistener.com/2017/07/before-it-goes-away-performance-and-reclamation-of-songs-from-blackface-minstrelsy.html.